Bhaktisiddhanta Saraswati Thakura (1874–1936), the spiritual master of A. C. Bhaktivedanta Swami Prabhupada, was a lifelong celibate and a powerful teacher of Bhakti. He was extremely intelligent and excelled in math, astronomy, Sanskrit, and other languages. The University of Calcutta offered him a chair, but he declined so that he could dedicate his life to continuing the spiritual work of his father, Bhaktivinoda Thakura. Bhaktisiddhanta Saraswati met with scholars, educators, and other leaders and wrote more than 108 essays and books, striving to present Bhakti as a theistic science. 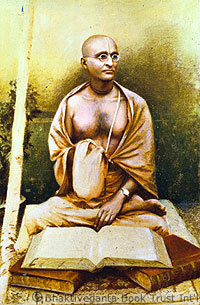 He established 64 temples, known as Gaudiya Maths, inside and outside of India. He asked his disciple A. C. Bhaktivedanta Swami Prabhupada to go to the West to teach Krishna consciousness. Srila Prabhupada went to New York in 1965 and carried on his spiritual master's mission on a grand scale.